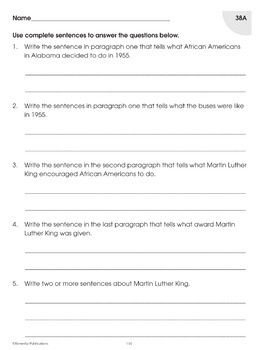 Expand students' knowledge of history while building comprehension skills! These outstanding units will introduce students to slavery, Booker T. Washington, Brown vs. Board of Education, Martin Luther King, Rosa Parks, and more. The four stories in this unit tell of important highlights in United States history. Each short story (less than 300 words) is paired with a picture chosen to give the reader a sense of the time in which the story took place. The picture can “set the stage” for the story, spark imagination, and perhaps motivate young readers to learn more about the topic. Each unit includes a short story and three activities. 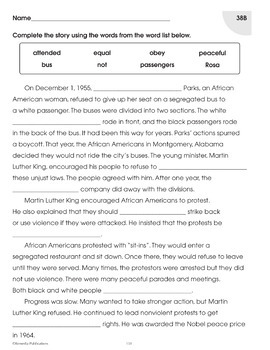 The first activity includes questions that direct students to specific paragraphs in the story to locate answers. 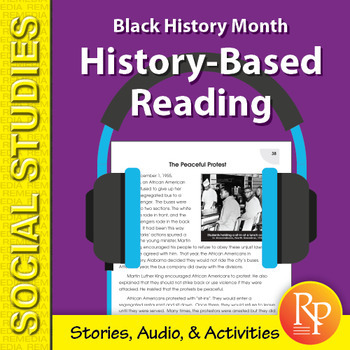 The second is a cloze reading activity that will give students another opportunity to read through the story while building vocabulary skills. 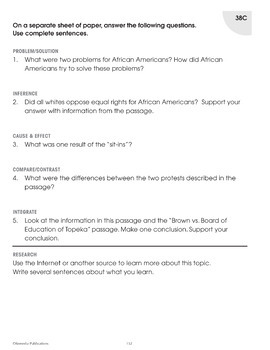 The third activity includes questions that are aligned to the Common Core State Standards. Each question is clearly labeled so you know which standard is being met. This enhanced PDF gives you the freedom to copy and paste the content of each page into the format that fits your needs. You can also access text for screen reader devices, export individual pages, make student copies, and more.